We are always on the lookout for fun activities that create shared quality time for kids and parents together. These simple wood and metal puzzles will have the whole family scratching their heads as they work together for an answer. Plus they make a lovely design object too. 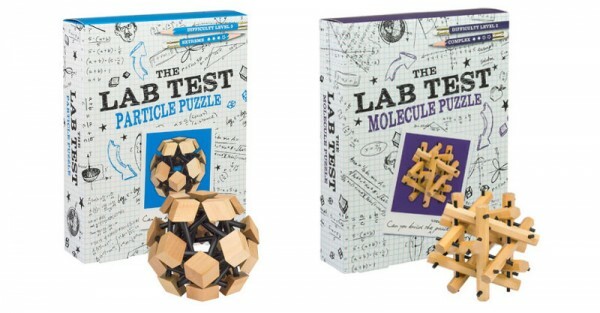 The Lab Test puzzles by Professor Puzzle are designed to represent different kinds of cells and particles. A wonderful way to learn about the building blocks of the universe during fun puzzle play. The completed puzzles are lovely to look at. You won’t want to pack them away but pop them on a display shelf as a contemporary science art piece. A nice touch to the modern kid’s bedroom. A good puzzle helps sharpen problem solving skills and keep brains active. A great puzzle creates quality time between parents and kids, while a brilliant puzzle also teaches as you play! These puzzles are certainly on the brilliant end of the scale. Recommended for kids over three years old, each puzzle pack also includes a solutions page in case you get really stuck. Can your youngster suss it out without checking the answer page? Can you? Professor Puzzle Lab Test puzzles are made in the UK and available through Alex and Alexa for $15.50 each, plus shipping. Express shipping to Australia is priced at only $9.95 and will reach your home in 2-5 working days. These make a great gift for any science-loving kid.